The idea of a coffee shop being in a high school may seem strange and out of place to some, but provides a boost in attitudes and energy in staff and students alike. All coffee lovers will appreciate the coffee at Griffin Grounds because it gives the option of three perfectly blended roasts from “The Roasterie.” Those who like it simple will enjoy the smooth texture of the Kansas City blend, but those who are daring with their choices will fall for the boldness of the Full Vengeance dark blend. 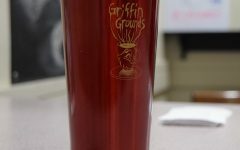 Griffin Grounds also appeals to those who are not fans of the bitter taste of coffee with other options available such as hot chocolate and apple cider. Although there are no “fancy” lattes, one can still enjoy the coffee by adding a flavor shot such as vanilla, hazelnut or caramel. The coffee shop also keeps trendy by adding flavors like the oh-so-popular pumpkin spice. How do you take your Griffin Ground coffee? Mix and match - every day is different! By having a coffee shop in the school building, students and staff are able to get to class faster and spend less money out of their wallets. Students do not have to worry about stopping at the nearest Starbucks and risk waiting in long lines that will prevent them from getting to school on time. The students who work in Griffin Grounds always ensure that the line keeps moving and people get their drinks in record time. Adding to this convenience, Griffin Grounds also delivers orders during the first two blocks and intervention to those who did not have the time to order in the morning, or for those need an energy boost. For the price of one Starbucks coffee, students are able to get two coffees at Griffin Grounds at the low price of one dollar. Also, students are able to bring in their own oversized coffee cup and add flavor shots are only 50 cents more. At these rates, Griffin Grounds coffee prices are an absolute steal. Some may criticize a coffee shop as too much of a luxury for ordinary high school students. It is certainly an amazing opportunity for special education students to practice applicable skills that will aid them after graduation. In this case, luxury is a necessity. 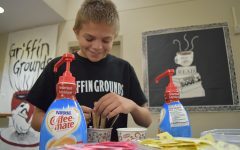 By having the special education students run Griffin Grounds, students are able to engage and interact in ways they were not able to before. This creates a school population filled with appreciation for those with disabilities rather than ignorance that seems to infect several schools. Overall, Griffin Grounds provides high-quality beverages, superior service and creates an attitude-shifting atmosphere. Griffin Grounds is worthy of an A.